Drywall Sheetrock Repair Pittsboro Siler City Chatham County NC. 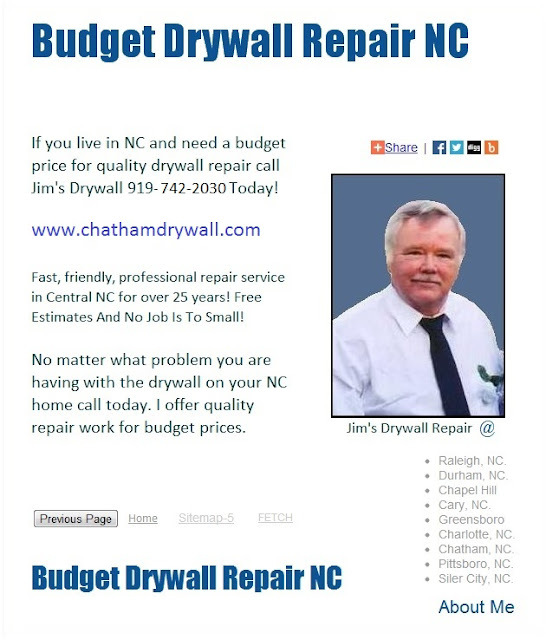 Live in Pittsboro, Siler City or anywhere in Chatham County, NC and need drywall repair work on your home. Call A Sheetrock specialist for a reasonable price and quality workmanship today. Drywall Sheetrock Repair | Pittsboro Siler City Chatham County NC. Live in Pittsboro, Siler City or anywhere in Chatham County, NC and need drywall repair work on your home. Call A Sheetrock specialist for a reasonable price and quality workmanship today. Drywall Sheetrock Repair Chatham County, NC.